The aim of The Caley is to support gardening and horticulture, in all its forms, throughout Scotland. By making a donation, you can help to support The Caley’s charitable activities, from our Grow & Learn education programme to the Demonstration Allotment. The Royal Caledonian Horticultural Society (The Caley) is Scotland’s national horticultural and gardening society. Members include both amateur and professional, generalists, specialists and many others who simply like gardens and gardening. We aim to encourage and improve the science, art and practice of all types of horticulture and to advance education in gardening and horticulture for everyone. Help support The Caley by making a donation today. With work at Saughton Park well under way, The Caley is on its way to achieving its aspiration of having a demonstration and teaching garden. Much of the work has been funded through a Heritage Lottery fund grant, however a much-needed glasshouse and potting shed, which will allow us to extend our range of classes and workshops, is not covered by these funds. By donating to this project, you will help bring The Caley’s dream of a people’s garden a little bit closer. 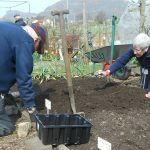 The Caley’s Grow and Learn Award is a practical horticultural award for people with a complex learning need. This may include for example, a learning disability, autism or a mental health challenge. The award offers a flexible framework, ensuring work is completed at a pace appropriate to the learner. On completion of the work, learners will have not only a portfolio of work but also The Caley’s Certificate of Horticultural Achievement. By donating to this project, you can help us to support many more people through the Grow & Learn Award. The Caley has an increasing number of activities focusing on gardening with children. We have a separate Junior Groups Spring Show for school & junior group entries, with a range of activities throughout the weekend and also have junior classes in the main Spring Show. 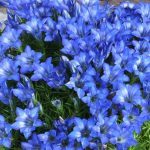 Information about both shows can be found on the ‘Spring Bulb Show’ page of the website. The Caley also produces a CD rom called Plant & Grow which provides a year-long programme of gardening activities for children. It has been developed with gardeners and children for use in both home and school environments. Donate to The Caley today and help to inspire the next generation of gardeners and horticulturists. By ticking the Gift Aid declaration box, it allows you to increase the value of your gift without paying a penny more by enabling us to reclaim tax that you have already paid at basic rate through UK income tax and/or capital gains tax. For every £1 you give, we can claim an additional 25p from HMRC. So, for example, if you donated £10, The Caley would receive an additional £2.50 from HMRC. Thank you for supporting the Caley. Your donation will be allocated in full to our charitable activities. What would you like this donation to be for?